This article is about the 1952 film. For other uses of the term "sound barrier", see Sound barrier (disambiguation). The Sound Barrier (known in the United States, as Breaking Through the Sound Barrier and Breaking the Sound Barrier) is a 1952 British aviation film directed by David Lean. It is a fictional story about attempts by aircraft designers and test pilots to break the sound barrier. It was David Lean's third and final film with his wife Ann Todd, but it was his first for Alexander Korda's London Films, following the break-up of Cineguild. The Sound Barrier stars Ralph Richardson, Ann Todd, and Nigel Patrick. The Sound Barrier was a box-office success on first release, but it has become one of the least-known of Lean's films. Following on In Which We Serve (1942), the film is another of Lean's ventures into a genre of filmmaking where impressions of documentary film are created. After his aircraft company's groundbreaking work on jet engine technology in the Second World War, John Ridgefield (Ralph Richardson), its wealthy owner, employs test pilot Tony Garthwaite (Nigel Patrick), a successful wartime fighter pilot to fly new jet-powered aircraft. Garthwaite is hired by Ridgefield after marrying Ridgefield's daughter, Susan (Ann Todd). Tensions between father and daughter are accentuated by Garthwaite's dangerous job of test flying. In a noteworthy illustration of the new technology, Susan accompanies Garthwaite on a ferrying assignment of a two-seater de Havilland Vampire to Cairo, Egypt, returning later the same day as passengers on a de Havilland Comet. Ridgefield's plan for his new jet fighter, "Prometheus", has placed the company in jeopardy. [Note 1] The problems faced by the new jet aircraft in encountering the speed of sound, the so-called "sound barrier", are ever present. In an attempt to break the sound barrier, Garthwaite crashes and is killed. Shocked at the death of her husband and at her father's apparently single-minded and heartless approach to the dangers his test pilots face, Susan walks out on her father and goes to live with friends Jess (Dinah Sheridan) and Philip Peel (John Justin), another company test pilot. Ridgefield later engages Peel to take on the challenge of piloting "Prometheus" at speeds approaching the speed of sound. In a crucial flight and at the critical moment, Peel performs a counterintuitive action (foreshadowed in the opening scene of the film) which enables him to maintain control of the aircraft and to break the sound barrier. Eventually accepting that her father did care about those whose lives were lost in tests, Susan changes her plan of moving to London and takes her young son with her back to live with Sir John. The strong relationship to aviation history in The Sound Barrier has led to its being characterised as a "semi-documentary". The film pays tribute to the British effort in the historic advance in aviation of the development and final perfecting of the jet engine by Frank Whittle and Power Jets Ltd and others following. David Lean had begun to gather research based on media reports of jet aircraft approaching supersonic speeds, interviewing British aeronautic designers. He even managed to fly with test pilots as he produced a 300-page notebook that he turned over to dramatist Terence Rattigan. The subsequent screenplay concentrated on the newly discovered problems of flying at supersonic speeds and is also loosely based on the real-life story of aircraft designer Geoffrey de Havilland and the loss of his son. Geoffrey de Havilland, Jr. was the de Havilland company test pilot who died on 27 September 1946 attempting to fly faster than the speed of sound in the DH 108. John Derry, another de Havilland test pilot, has been called "Britain's first supersonic pilot," because of a dive he made on 6 September 1948 in a DH 108. Contrary to what is depicted in the film, the first aircraft to break the sound barrier was the rocket-powered Bell X-1 flown by Chuck Yeager of the United States Air Force in 1947. As Yeager, who was present at the US premiere, described in his first biography, The Sound Barrier was entertaining, but not that realistic – and any pilot who attempted to break the sound barrier in the manner portrayed in the film (forcing the centre stick forward to pull out of a dive) would have been killed. [Note 2] Because the 1947 Bell X-1 flight had not been widely publicised, many who saw The Sound Barrier thought it was a true story, and that the first supersonic flight was made by a British pilot. Malcolm Arnold (later knighted) composed the music score, for this, the first of his three films for David Lean. The others were Hobson's Choice (1954) and The Bridge on the River Kwai (1957). The Sound Barrier, in its American title as Breaking the Sound Barrier, was reviewed by Bosley Crowther in The New York Times. According to Crowther, "this picture, which was directed and produced in England by David Lean from an uncommonly literate and sensitive original script by Terence Rattigan, is a wonderfully beautiful and thrilling comprehension of the power of jet airplanes and of the minds and emotions of the people who are involved with these miraculous machines. And it is played with consummate revelation of subtle and profound characters by a cast headed by Ralph Richardson, Nigel Patrick, and Ann Todd". Film historian Stephen Pendo further described the "brilliant aerial photography. ... Along with the conventional shot of the aircraft there is some unusual creative camera work. To illustrate the passage of a plane, Lean shows only the wheat in a field being bent by air currents produced by the unseen jet. ... Even the cockpit shots are very good, with the test pilots in G-suits and goggles framed by the plexiglass and sky backgrounds." 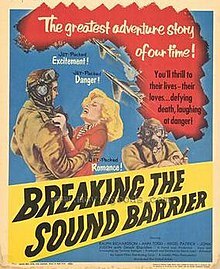 The Sound Barrier was the 12th most popular movie at the British box office in 1952, and also did well in the United States, making a comfortable profit. With this film, Ralph Richardson became the first actor to win the New York Film Critics Award for Best Actor who did not receive an Oscar nomination. ^ Drawing on ancient mythology, Ridgefield notes that Prometheus "stole fire from the gods". ^ Control reversal, though applying in this context, is not a legitimate aerodynamic technique: it is actually the result of insufficient tailplane stiffness, the elevators acting as though they were trim tabs twisting the tailplane to produce an aerodynamic effect opposite to that intended. ^ The film crew had a near-tragic episode on the Lancaster bomber as they suffered from hypoxia when their oxygen system failed. ^ A list of the aircraft appearing in the film follows the opening credits. ^ a b Kulik 1990, p. 316. ^ Porter 2000, p. 498. ^ Pratley 19874, p. 106. ^ Paris 1995, pp. 173–174. ^ Pendo 1985, p. 137. ^ Hardwick and Schnepf 1989, p. 69. ^ Pendo 1985, pp. 133, 135. ^ Davenport-Hines, Richard. "Havilland, Sir Geoffrey de (1882–1965)". Oxford Dictionary of National Biography. Oxford: Oxford University Press, 2004. ^ de Havilland 1999, pp. 169–170. ^ Rivas, Brian, and Bullen, Annie (1982), John Derry: The Story of Britain's First Supersonic Pilot, William Kimber, ISBN 0-7183-0099-8 . ^ Carlson 2012, p. 212. ^ Yeager et al. 1997, p. 97. ^ Yeager and Janos 1986, pp. 206–207. ^ Brown 2008, p. 212. ^ "Faster Than Sound" (transcript). PBS, Airdate: 14 October 1997. Retrieved: 28 April 2015. ^ Carlson 2012, pp. 211–212. ^ a b Pendo 1985, p. 135. ^ Davies and Birtles 1999, p. 15. ^ Winchester 2005, pp. 312–313. ^ Hamilton-Paterson 2010, p. 46. ^ "Malcolm Arnold." Music Sales Classical, 2014. Retrieved: 30 April 2015. ^ "The Film Music of Sir Malcolm Arnold, Vol. 1." chandos.net. Retrieved: 30 April 2015. ^ Crowther, Bosely. "Breaking the Sound Barrier (1952); The Screen: A quality British import; ' Breaking Through the Sound Barrier,' based on Rattigan story, at the Victoria; Ralph Richardson, Ann Todd and Nigel Patrick head cast of film on jet airplanes." The New York Times, 7 November 1952. ^ "Comedian tops film poll." Sunday Herald, p. 4 via National Library of Australia, 28 December 1952. Retrieved: 24 April 2012. ^ "The 25th Academy Awards (1953) Nominees and Winners." oscars.org. Retrieved: 20 August 2011. Brown, Eric. The Miles M.52: Gateway to Supersonic Flight. Stroud, Gloucestershire, UK: The History Press, 2012. ISBN 978-0-7524-7014-6. Brown, Eric. Wings on my Sleeve. London: Weidenfeld & Nicolson, 2006. ISBN 978-0-297-84565-2.
de Havilland, Geoffrey. Sky Fever: The Autobiography of Sir Geoffrey De Havilland. Ramsbury, Marlborough, Wiltshire, UK: Crowood Press Ltd., 1999. ISBN 1-84037-148-X. Hamilton-Paterson, James. Empire of the Clouds: When Britain's Aircraft Ruled the World. London: Faber & Faber, 2010. ISBN 978-0-5712-4795-0. Pratley, Gerald. The Cinema of David Lean. Aurora, Colorado: Oak Tree Publications, !974. ISBN 978-0-4980-1050-7.